Lately there have been some substantial changes in the online music world. Apple, Google and Amazon have storage services for your music, along with the accompanying stores to purchase tunes. On the storage side, each service has their advantages [and disadvantages]. After living with each for a while, I thought I would do a run-through of what features each service offers. Update Sept 2018: Amazon MP3 match is no longer available. The Match service from Apple is more of a storage locker solution than a ‘play anywhere’ product. iTunes will upload or match the music in your iTunes Library, and then it can be made accessible to any computer with iTunes or any IOS device, like an iPhone or iPad. One thing that is unique with Match is how it stores your music. iTunes will examine your music files, and if it finds a ‘match’, only the file info is uploaded, not the actual file, so any subsequent downloads will actually be like you purchased the song from the iTunes Store. The format will be a 256 AAC file, although iTunes does upload any custom tags or artwork for your file, which is a nice feature. This means if you have a lower quality file on your computer, if you re-download it you will replace the song with a higher quality version. I have found the ability of iTunes to match songs that I know it has available at around 80-85%, meaning some songs it should find nonetheless are uploaded. However songs purchased from Amazon, eMusic, etc seem to have a much higher success rate, the issue being music from my ripped CDs. I believe the algorithm used not only takes a sound-print of the song, it also takes into account length among other things. If an album has 10 songs, all should match, but sometimes 1-2 songs have to be uploaded. Most of my CDs are older releases, and possibly newer versions of the albums have slightly different song durations, confusing Match Hopefully the method Apple uses to identify songs will get better over time. iTunes Match will upload any songs it cannot identify or are not in its library, making a copy online. The only limitations are very low bit-rate files and AAC Lossless files. AAC LL files will be converted to a regular AAC file before upload, and any file that has a bit-rate below 96 will not be uploaded. Hint: If you right-click on the file in iTunes, select “Make an AAC/MP3 etc.. Version” and iTunes will duplicate the some at whatever format you have set up for importing, and as long as it is 128 or greater, iTunes should allow it to be uploaded. Match, however, requires a computer or iDevice to access, there is no online streaming from a browser. You can set your mobile iDevice to use its internal library or Match, but not both. You are presented with a list of available Match albums, and you can download them to your iPad, etc. There is also a setting to hide this and just show music on your device, making browsing easier. It is not exactly fast but you can select an album, go to another album, select another song, and it will put it in the queue. You can also play a song directly and it will play as it downloads. On your computer you have the same options, although you have both your local library and the Match music that is in the cloud. This is probably more relevant if you have more than one computer, with the main computer the full catalog of all your music, and maybe a laptop that you download only some of the songs. You can also stream music without having to download it. The iTunes Match service is not free, but at $25 a year, this is a cheap way to back up all of your music. There is a 25000 song limit for storage, but unless you are like me, that should not be a problem for most people. Overall a good service, without having to upload your entire collection. The ‘Match’ process is also automatic, so any new songs added are matched. The initial process can take some time, so it might be a good idea to let iTunes work on its own the first time you activate the Match service. 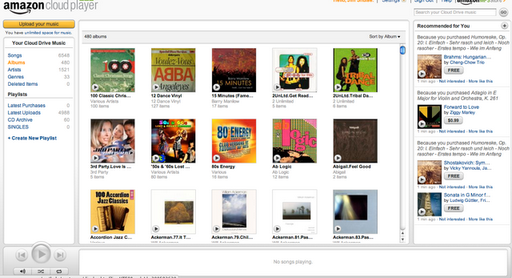 Amazon uses the Amazon MP3 Uploader to manager your music. 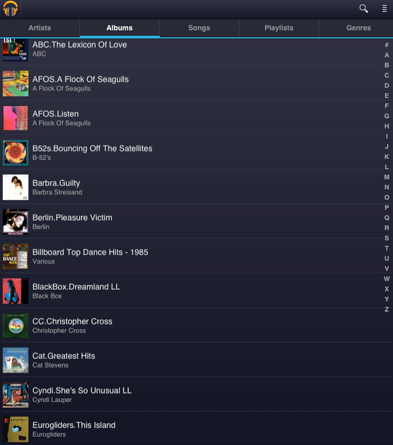 The program will search your iTunes Library, and automatically start uploading your music. You can also select other folders, and pause the service. If you just let it run, it will eventually upload all of your music. Almost as easy as iTunes Match, and fairly reliable and simple. The uploader has frozen on some occasions, but nothing too bad. Overall I have had good luck with it, and the uploads start quickly and are steady. You have access to your library online at Amazon’s Cloud Player page, and it has your basic Artist, Song, Genre, etc options, with album art thumbnails. The layout is decent, although they have added an obnoxious ‘Recommended For You’ panel to the right side of the player in a too wide area. I find it useless and annoying. Interestingly, the panel seems to only show up when using Chrome, not Safari or Firefox. There is a bit of chatter about this on the Amazon message boards, but basically a ‘we know, whatever’ answer from them. I have CCed a copy of the comment I sent to the Development Team for the Cloud Player at the end of this post. To be fair, Google also has a ‘Recommended’ area, but only on the home landing page and below my album listings. Playback seems reliable, and you can create playlists. It is easy to download a song or album to your computer, simply select the checkboxes and click Download. The Mobile version on iPad is a different matter. Yes, it will play a song, however the ‘scrub bar’ to fast-forward thru a song does not work, and if you leave the page for another tab in Safari, it will not alway play the next song, and switching to another app will immediately stop the music, so background playing is not an option. There is not an iPhone optimized site, although they do show an Android App. Overall the service is good, reliable, and if web playback is important from any computer, a good choice. Unlimited music is a plus, even though you have to upload all of your files. Google had just renamed their online media services ‘Google Play’, combining Music, Video and Books, probably in an attempt to be more like iTunes and Amazon. There is a 20000 song limit, however the service is free. You upload music through the Google Music Manager App [more of a Preference Panel app]. I have had numerous issues with this. When first uploading music, it wants to analyze and think…….forever. I aimed the app to a folder with just a few songs, and still it sat there forever, or would hang up, never completing the upload. I am not sure if they ever got this fixed, but I found that if you initially aim it at an EMPTY folder, the GMM app would analyze, attempt an upload and then actually complete the process. After the initial sequence, adding a folder with music worked much better. I would suggest you not let GMM try and upload your iTunes Library first thing, do a trial on a small set of music, or use the empty folder trick to get things started. The Google Play website is similar to the Amazon Cloud Player, and playback is quick. Along with Songs, Artist, etc, you can also create an ‘Instant Mix’ similar to iTunes Genius. They selection of music is interesting if not completely relevant to the song used to create the mix, but it did manage to avoid throwing classical music into a mix generated by a Simply Red song, so not too bad on that front. At first there was no way to download your uploaded music from Google Play. However, there is now a ‘Download’ option in the song’s drop-down menu, although you get an ominous ‘You can only download purchased songs twice’ message. When I clicked through on the ‘Learn More’ link, the info stated: ‘You can only download each purchased track from the web 2 times.‘ I downloaded one of my uploaded songs 3 times in a row, so I presume they only mean music purchased from Google. Bad wording, although I think the misunderstanding may be deliberate to discourage downloading of individual songs. There is also an option to download your ENTIRE library in the Google Music Manager, no real choice here, all or nothing. Not sure how it handles stopping in the middle, and there seems to be no option to keep track of downloaded songs. It may be there, but once again, GMM is not making things clear. One bonus that the other services do not offer is the abilty to edit the tags of your music with the ‘Edit Song Info’ in the drop-down menu. This is not possible with the other services. Playback is good in a browser, quick start, and responsive. On the iPad, I was presented a mobile version of the site, stripped down but usable. Seems to be formatted for a phone, not an iPad. So I used the option to go to the Desktop Version, which has larger album art, etc. Works the same as on my computer, however you cannot play any music, it simply does not work, at all. So it is the mobile version or nothing. My main issue with the service is a lack of polish. The upload app is flakey, and why have a ‘Use Desktop Version’ link on the mobile version if it will not play anything, and some of the wording is unclear. Google has never been great on the UI front, but does anyone ever check this stuff out there? Overall, each service is good for what it does. 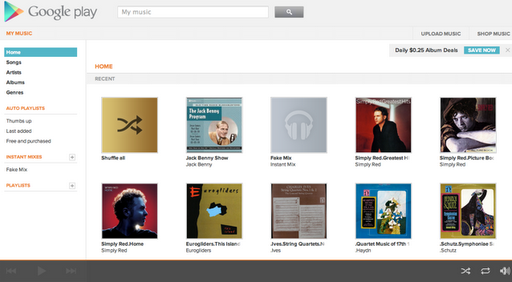 If you want free, Google Music is a good deal. If you purchase music from Amazon MP3, their option is equally a good choice. If you want the easiest route, and do not care about online streaming, iTunes Match is definitely a good deal for the price. You can back up your music collection with almost no effort, and if you have ever had a hard drive die on you, the pain of losing your files is something you know is best to be avoided. I use Match and Amazon for the most part, but am now keeping some music on Google since they now allow you to download. That was a big issue for me, especially as a backup solution. This is in reference to the ‘recommended for you’ panel that has invaded the Cloud Player. Just to be clear from the start, I do not like it. It really takes up too much room, and it is recommending a lot of music I already have, so it is pretty much useless to me. I wouldn’t mind so much if it wasn’t so darn big. Really, there is a lot of wasted space at the bottom of the player for the album and time indicator, which I also am not thrilled with, add those together and you get a LOT of wasted space. On a smaller screen it is almost too much. I know the deal, advertising, and if I had a free account that would be ok, but I am due to renew my subscription soon, and frankly, as bad as it is, Google Music is looking better. I do not want a bunch of ads on a paid service, and you need to realize that anyone paying for the increased storage are probably good customers, and this is just not a way to keep us happy. Since I suspect you will be keeping this thing anyway, how about moving it to the bottom, horizontally, and using some of the wasted player space? Or allow us to shrink it down to just the album art, something to save space.